Captain Olav welcoming guests onboard Explorer. Pausing to joke with the guests. Captain Olav hosting a nautical triva contest with Cruise Director Jimmy Rhodes. Captain Olav answering guest questions at a Captain's Corner. Captain Olav Nysetter was the first captain of Explorer of the Seas, bringing her into service in October 2000. Indeed, his association with the ship goes back before that as he was part of the planning and new-build team for the Voyager class of ships of which Explorer was the second one to be built. The Voyager class ships were all built to the same basic design and offer the same basic menu of service and activities. Yet, each has its own personality. "We have five Voyager class ships, all different. It is up to the management of each ship how it is going to work out. If you want to try and change the personality it is absolutely not done overnight. It takes a long time really because probably in the beginning the crew might not trust your efforts and think there is something behind there. To get through to the whole entire crew will take a long time." What is Explorer's personality? "We are the friendliest ship in the fleet. That's what we think aboard the ship." Apparently, many others share that view. "People seem to love the Explorer. We must be doing something right because certain people come back time after time. It seems to be quite popular. We had the repeat passenger party yesterday and it was 1,608 Crown and Anchor members on the ship - - half [of the passengers]. It has been that way since I came back [from vacation], we have had 1,500 or 1,600 every cruise." Of course, part of this is due to the fact that Explorer is based in New York Harbor, sailing out of the Cape Liberty Cruise Port in Bayonne, New Jersey on a year round basis "The drive-up market is very important because of all the hassle you have when you are flying these days. Here, there is no restriction on luggage." As for Explorer's future, Captain Olav sees the ship evolving to meet the demands of the times. "I am convinced that on the next drydock we will do some major project to refurbish the ship. I think one of them is going to be [adding] a Florider, for example." "I also believe that we will not be in New York forever. A ship like this could very well end up in the market for three or four day cruises for example. Not that I know but I think that is the trend. These ships would be quite suitable for that." Explorer's friendly personality is fostered by Captain Olav's style of command. He is a very visible and approachable captain. "You cannot just sit in front of your computer and think that everything is going to be nice and dandy because that doesn't work. I really try to be out and about quite a bit. I'll take time to be here and be there and participate in whatever events are required. If you do not connect with the customers, you do not know what is going on. So that is very important." "Teamwork I feel is really essential, it also reflects down to the lower ranks and you normally get that throughout the ship. If you have people at the top that are going in various directions, egocentric, that doesn't work very well for the friendliness on the ship." "You have to trust people also and you have to let them do their jobs." For example, Captain Olav does not always dock the ship himself. "I have my other officers do it. I am standing next to them. They really enjoy to do this and that's how they learn. Hands-on training is very important." 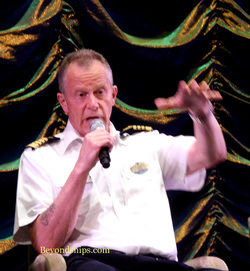 Captain Olav's style of command is similar to that of another Royal Caribbean captain, his son Captain Tommy Nyseter. "The first time he was with me [at sea], he was not even six months old. He was onboard for about three or four months and before he was a year old, he could swim. So he sailed with me many times and I think he liked it very much. I think that he decided that he wanted to go the same way. He was very lucky. He came into this company and he was captain before he was 33 years old - - very young." Did his father encourage him to become a sea captain? "I don't think so. I think the plan was that he was supposed to be a policeman. He made it himself." When he is not at sea, Captain Olav is often involved in artistic pursuits. "I have always liked to work with my hands. I make stained glass windows and a lot of woodwork, tile work, if necessary. When you get out of this environment, you have to put your mind to something else." One project was inspired by something he saw while cruising. "I was captain of the Sun Viking in Alaska and I was fascinated by the totem poles up there." This led him to carve a set of totem poles as supports for the veranda of a house he had in his native Norway. Later, when he was building a house on some property that he had purchased in West Virginia, he embarked on a more ambitious project. "There happened to be an oak tree that was standing where the house was to be built. So I had the builder put it on some sawhorses. It was laying there for more than two years before I started it so it was very dry and hard to carve. It became about 30 feet tall above ground." advertisement he saw in a local paper while on vacation in Baltimore, Maryland, where he now lives. "They advertised a course. I started and I got hooked and since then I must have made 60 or 70 different pieces." Captain Olav works with his wife on these projects. "She likes to make things too, especially paintings and she is very good with colors. So when we make windows for clients I always have her to discuss the colors with the client." Once again - - teamwork.